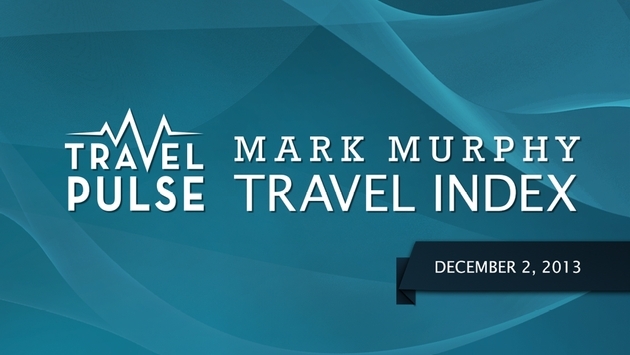 As we put Black Friday in the rear-view mirror, welcome to the Dec. 2 edition of the Mark Murphy Travel Index. The idea here is to give you a one-stop reference tool to find where the deals are, where the spots to avoid are and what the pricing trends are. We're looking at the top 25 business and leisure airline routes, as well as the top car rental and hotel hot spots every week. And we'll add in a look at cruise prices once a month. 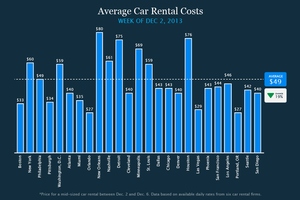 To be clear: Our numbers are based on research done last week looking for fares and rates for the Dec. 2-8 week. This week, we have a mixed bag of news for travelers. Leisure travel and car rentals fares are down but business travel and hotels spiked as business travelers return to the trail this week. Let's get into the information this week. Click on each image for a larger-size version of the chart. 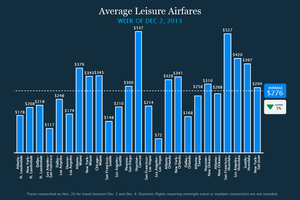 - Leisure fares continue to drop as vacation destinations empty out in between holidays: flights to Florida are down 10 percent from last week, and fares between Seattle and southern California are down nearly 40 percent from Thanksgiving week. - Spirit Airlines had the lowest fare in six of the 25 markets surveyed. 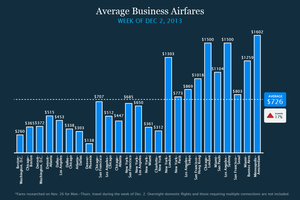 Delta and U.S. Airways are the next closest, with lowest fares in four markets apiece. - And some information to pass on: Delta is expanding its poplar Porsche Pick-Up program to Los Angeles (LAX), New York (JFK) and Minneapolis (MSP). The service is available to selected SkyMiles Diamond Medallion members, who will be greeted at the boarding area by a Delta agent. 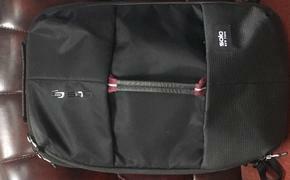 They are then escorted to an awaiting Porsche vehicle and driver who transports them on to their connecting gate. Customers are selected by Delta based on their flight(s) and connection time. The program has been available to passengers in Atlanta since 2011. - Business fares tare up 17 percent following the holiday week with prices up on every domestic route. Ticket prices have more than doubled for transcontinental travel and on Boston to Chicago, Dallas to Los Angeles and Dallas to Atlanta flights. - U.S. Airways had the best rate in eight of our 25 markets surveyed. Spirit had best rates on four routes, while JetBlue had the best on three routes. 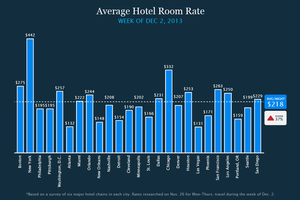 - Room rates are up sharply in every city, as business travelers check back in to hotels following the holiday week. Rates are up in all 25 cities, and overall prices are nearly 40 percent higher than last week. Rooms are at a premium in Washington, D.C. (up 92 percent from last week), Chicago (+ 42 percent), Boston (+50 percent) and Orlando (+52 percent). - New Orleans will be overflowing with U.S. Attorneys General, while Houston welcomes the Texas Association for the Gifted and an oil and gas industry IT conference. Nashville hosts the National Groundwater Expo, and Washington, D..C., which was a ghost town last week, is the site of a technology conference for associations and non-profits and the annual gathering of the National Association of State Energy Officials. - While the overall average is down 19 percent from last week, business travelers can expect to pay more for a rental in Nashville (+45 percent), Minneapolis (+73 percent) and St. Louis (+64 percent). Prices are down from holiday highs in New York (-47 percent), Atlanta (-31 percent), Orlando (-41 percent ) and Miami (-75 percent). - Active duty U.S. military personnel can eat for free at participating restaurants at the Austin/Bergstrom airport through January 1. Participating venues include Annie’s Café, Maudie’s TexMex and the Saxon Pub. - Planning a visit to the Windy City? Chicago-area Marriott properties are holding a “Cyber Monday” sale, offering guests an additional 30 percent off the best available rates for bookings made on Dec. 2. Check with Marriott for a list of participating hotels. - Let the White House know your opinion on the proposal to allow telephone calls on U.S. flights by logging on to www.petitions.whitehouse.gov/petitions. The Administration has opened the site to enable travelers to sound off on the proposal, and will be accepting comments through Dec. 21. Let us know what you think of the Index. Hit us up on Twitter @TravelPulse.